She has labored untiringly since 1984 as publisher, reporter, editor, columnist, and photographer in offering a voice to all segments of the community. In 2000, her company bought the weekly ‘Windy City Times’ and merged her weekly ‘Outlines’ into it. She also publishes the weekly ‘Nightspots’, plus ‘BLACKlines’, ‘En La Vida’, and the ‘OUT!Resource Guide’, besides airing Windy City Radio. In addition, whe helped to found and has co-chaired the Chicago Gay and Lesbian Chamber of Commerce. 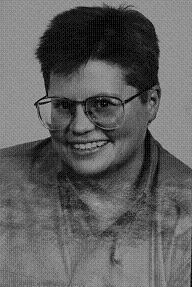 Tracy Baim a 31-year-old native of Chicago, has made a tremendous impact during her ten-year career in the gay and lesbian press in Chicago. She has contributed her untiring efforts as publisher, journalist, editor, and photographer in providing a voice to all segments of our community. Currently the publisher and managing editor of Lambda Publications, which produces Blacklines, Nightlines, Outlines, and the OUT! Resource Guide, Baim has written over 2,500 articles, columns, and editorials. Each of these publications provides a venue highlighting not only national and local news of immediate importance to the gay and lesbian community but also focusing attention on the diversity and depth of our cultural achievements. Baim received a degree in journalism from Drake University in 1984. Upon graduating, she took a job as editorial assistant at GayLife, becoming managing editor there a year later. In the fall of 1985 she helped to found Windy City Times, and in 1987 she was the founding publisher and managing editor of Outlines. During that time she has covered thousands of events, from bar parties and sports tournaments to black-tie benefits. It is the support of her coworkers, family, and friends, along with the backing of the community in general, which has allowed Baim to maintain her 70+-hour-a-week schedule for ten years. With a keen eye for news and her ever-faithful camera, she chronicles our day-to-day lives. She has won considerable recognition for her work. She was a finalist for editorial writing in the 1993 and 1994 Peter Lisagor Chicago Journalism Awards. She has been recognized by NOW: Chicago Chapter, Dignity, and the 1987 and 1993 Marches on Washington. She was named MVP of Chicago’s 1993-94 indoor soccer season and has been honored as a Lee K. Bubblehead. Baim was a recipient of the 1994 Chicago Torch Award presented by the Human Rights Campaign Fund. A strong advocate of human rights, Baim continues her vocal battle against racism, sexism, and homophobia. Editorials such as her award-winning “Go Home, Faggots” provide an opportunity to reflect on the current state of our lives and on possibilities for the future. She holds up a mirror to the society in which we live and is not afraid to spotlight its blemishes.